Who knew The Maze Runner's Dylan O'Brien could out-Bourne Matt Damon's Jason Bourne, but he does in Michael Cuesta's American Assassin. Granted, the last Bourne film was pretty terrible in its awkward attempts to adapt to the new cyber age of counter-terrorism. 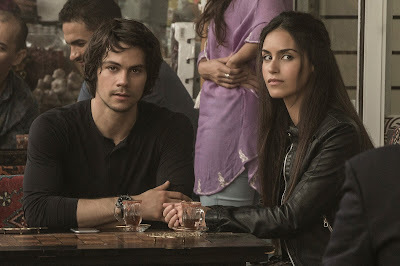 American Assassin on the other hand is strictly old school, Tom Clancy-type stuff with a contemporary flair and O'Brien, while not the most credible action star the genre has ever seen, has the presence to grow into a believable boogeyman terrorists can quake in their boots over. O'Brien plays Mitch Rapp, popular Black Ops dude from the late Vince Flynn's series of bestselling novels. He's a little bit Jack Reacher, a little bit Jack Ryan...it's a wonder his first name isn't also "Jack". The film begins in brutal fashion, as Rapp watches his fiancé gunned down by terrorists moments after his beachside proposal. The tragedy changes him from a guy who looks like he just walked off the Teen Wolf set, to a guy who looks like he's been living in the woods feeding off grubs and tree bark. Rapp has become consumed with vengeance against those responsible for her death, and dedicates every waking moment to finding them, infiltrating them, and killing them. Just as he's about to do everything he's been training himself to do, the CIA, led by Deputy Director Irene Kennedy (Sanaa Lathan) intervenes and takes him away. Although a loose cannon who can't take orders well or work with a team at all, Rapp is placed into a Black Ops program run by prickly Cold War vet Stan Hurley (Michael Keaton), who is prepared to chew up and spit out the new kid. Turns out the new kid is good. Scary good. He scores through the roof; but most importantly the CIA loves his gung-ho attitude for killing terrorists. It's perfect because one, an elusive and dangerous arms dealer known only as "Ghost" (Taylor Kitsch) has set in motion events that could lead to a nuclear attack. It's all pretty much by-the-numbers stuff from here on out. Rapp gets in the middle of an escalating cat 'n mouse game that involves some fierce firefights, car chases, and fisticuffs all across Europe. Cuesta, whose last political thriller was the less action-oriented biopic Kill the Messenger, stages a handful of exciting sequences that keep the blood pumping. They also help you overlook the rote plotting which, with the exception of one supporting character's motivations, is easy to predict beat-by-beat. Also a plus are the performances by O'Brien and Keaton. In his first truly adult role O'Brien is magnetic, quick, and agile, but still not totally believable as a guy who can whup an entire room of trained killers. But seeing as how this is basically an origin story for what is expected to be an expansive franchise, it's expected that O'Brien will be better acclimated the next time around. Matt Damon got better as Bourne went along, and O'Brien has the same potential. Awesome right off the bat is Keaton, of course, going full-on Nic Cage bonkers as Hurley, who puts Rapp through Hell, takes torture like a man on vacation, and isn't afraid to take a literal bite out of terrorism. Keaton is having way too much fun for the oh-so serious American Assassin, but his over the top portrayal is a welcome breath of fresh air. Rapp and Hurley's "We kill people who need to be killed" mentality is about all of the moralizing American Assassin affords, which is fine for a first chapter. Hopefully, if there are more we can begin to see some shades of grey in Rapp's mission emerge.